The 2015 Audi Q5 is a good car all around. This car is like a character out of Transformers. The back seats fold all the way down, allowing a lot of storage room. Optional roof racks allow you to mount your bike or a storage carrier. This car is very good on snow. It has the optional Quattro all wheel drive system. I have driven this car through an eight inch blizzard with no problem. People would be surprised that such a compact SUV can be so powerful. This car is also very fast, allowing you to zip around in an SUV. The only down part of this car is the fuel economy. This car has low gas mileage for a small SUV. I only average 20 mph in this SUV. Cars of the same size like the Honda CRV or BMW x3 get better gas mileage while being the same size. One more caveat, parts for this German import are expensive. Make sure you have an extended warranty, or it will cost you more in the long run. Overall, the Audi Q5 is all around a good every day and reliable car. I would definitely get this car when the new version comes out. You should definitely get an Audi Q5 for your adventures. Good control and handling for the winter. This car offers good room for its small size. Expensive car, will cost you over $40k easily. Gas mileage is not that great. Expensive to maintain if anything goes wrong. Parts are also expensive. 2014 Audi Q5 - I love the Audi Q5. My brand new Audi Q5 also had engine failure. 3 days old with 110 miles. Started making loud clacking and rattle that increased with acceleration. Had to creep home with engine sounding like ready to blow - glad didn't happen to my wife or daughter driving at speed on highway. Dealer didn't bother to open up and see what specific issue was but said if kept driving could throw a piston. So they ordered a complete new engine - but not from Mexico where mine was built. Awaiting to hear when engine received and how long will take to repair. Have heard the same dealer had another Q5 implode with same issue. Either Mexico workers are taking revenge on us and/or Audi quality control is lacking. I know anything can happen to any car but think Volkswagen/Audi would recognize they have a serious issue on hand. I would recommend a friend to buy this car which is stylish and has all facilities in it. When it comes to compact SUVs, the Audi Q5 is among the most luxurious out there. But what sets the Q5 apart from other bespoke options is Audi's attention to detail. Everything about Audi's interior design is purposeful; it's smart, intuitive, and sophisticated without feeling over-the-top. The Q5 stood out so much that it's currently a finalist for Business Insider's Car of the Year. As we inch closer to revealing our big winner, I wanted to share the reasons why I thought the Audi Q5 was an immediate contender. Me and my wife own a 2014 Audi Q5. Just pass 61000 miles. Last week I was driving the car and trying to make a left turn, the steering wheel get locked. Doesn't move the steering wheel left or right. Finally AAA took the car to the Audi dealership. Next day service advisor call me and tell me the steering wheel rock and pinion need to replace. The cost is $ 3500. I call Audi customer service, file a complaint, the lady told me she is going to review with the service dept. and let me know the updates. I wait for 6 days she never call me, I trying to reach her almost 6 times. Finally after 12 days she call me and tell me they can't help me this time. I don't know why she took that much time to say to me this answer. I never ever buy or lease another Audi, that is for sure. This car has it all! Fuel efficiency, cargo space, fun to drive, sporty and lux look! Everything you could want! The standard features are a lot and more than any other luxury cars in the same price range. The panorama sunroof is super nice and convenient, and the different seat configurations for passengers and cargo is great! When the rear seat is up, there is a noticeable lack of space behind it. Having the seat raised decreases luggage space by 0.4 cubic foot. However, there is still plenty of space in the cargo area, so this is a relatively minor gripe. 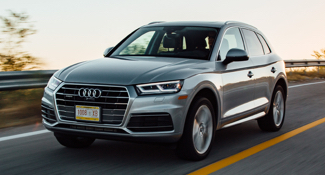 The only engine that can be equipped on the 2018 Audi Q5 is the standard 2.0-L 4-cylinder turbocharged engine, which is paired with a seven-speed dual-clutch automatic transmission. While some drivers like being able to choose between a few different options, this isn't a bad engine. Its 252 hp and 273 lb.-ft of torque are sufficient for getting the vehicle moving.